Happy Home Imitation Vanilla Flavor , Alcohol Free Vanillas: Southern Flavoring Company, Inc. Happy Home Imitation Vanilla has all the taste with no alcohol! Our original 1929 formula. I have purchased clear butter flavoring, clear vanilla and vanilla by the gallons. I have been very pleased with everything and the taste is excellent. I use these for baking and making buttercream. Shipping is fast and packaged well. Southern Flavoring always provides an excellent product and fast dependable service. I wouldn't order from anywhere else. I use Happy Home Flavorings whenever I bake a cakes. I have been using them for as long as I can remember. I have quite a few different ones and have always been pleased with them. I always keep extra vanilla and lemon on hand. You can't beat Happy Home in pound cakes. This is a great product and a great fund raiser. I love the Southern Flavoring vanilla. I do a lot of baking and I have found this particular vanilla the best for the money. Happy Home flavoring has been a tradition in my family for decades. My grandmother swore by Happy Home Vanilla Flavoring and refused to use anything else. Some may tell you that vanilla is vanilla and it all is "almost the same" -- well, they are wrong. This vanilla flavoring is the VERY best and is perfect for everything from homemade ice cream to all of your favorite pies and cakes. Thank you Southern Flavoring for keeping our home a "happy home." Owner Response: Wow! Thank you very much for that great review of our Vanilla Flavoring! We appreciate your family's trust for all these years! We have been using your products for a number of years and always very pleased with them. I received my items in good time. Love the product. Have been using it for years and years. First time ordering directly from your company. Ordering was very easy! Received quickly! I have been buying from you for many years. I have your flavorings on hand to sell to my family members. I have always enjoyed the flavorings. I have used happy home for many years and I just love it. This is the first that I ordered it from the company, because the lady I used to get it from sold it for her church and she passed away! Owner Response: Thank you Sharon for your comments. Its great to hear that our Happy Home Vanilla has been a favorite family tradition for you as it has been in mine as well! Keep that tradition going! I use at least 10 flavorings for cakes, pies, cookies and they are full of flavor. You will not be disappointed! You undoubtedly have the quickest delivery of your product I have ever seen. I have used your flavoring for many many years and love them, it's just sometimes hard to find. I love this flavoring and do not like to bake without it. This company is easy to order through, had great prices, and has very fast delivery. Owner Response: Thank you for your comments! Have found it difficult to find Happy Home Imitation Vanilla flavoring. Not only found it, but buying 12 bottles made it such a bargain. Your flavorings sell well in our rural setting, and that is why I began ordering them when I took over at Bacon's Castle Supply. My grandmother used this vanilla. She would be a 110 years old if she was still alive. She got her vanilla from her church. She was an excellent cook! I wanted to cook like her so I have purchased vanilla from you since she passed away. I love it and will continue to make good food using this vanilla . Thank you! Owner Response: Thanks for the nice comments about how you got started using Happy Home Vanilla! Keep baking and we'll keep making our vanilla just for you! My grandmother and mother used Happy Home Flavoring and so have I all my adult life. There is always a bottle on my shelf. Owner Response: Thank you so much! Just keep on using it...and we'll keep on making it! Best imitation vanilla I have ever used, happy I found your site. Owner Response: Thank you! Our imitation vanilla recipe is the exact same as it was back in 1929. It contains no alcohol, so the robust vanilla flavor is not baked out of your cakes and desserts! I have used the vanilla flavoring from this company for a number of years. The product has always been excellent. Owner Response: Thanks for the nice comments! Our vanilla flavor uses the same recipe that started our company back in 1929! Time-tested. I love this brand of imitation vanilla flavoring it is better in recipes than other brands I've tried. I enjoy ordering from this company the only drawback is the shipping cost. Owner Response: Thanks for your review, Peggy. We do our best to provide the lowest shipping costs that we can. Rest assured that we will keep them as reasonable as we possibly can. Happy Holidays! 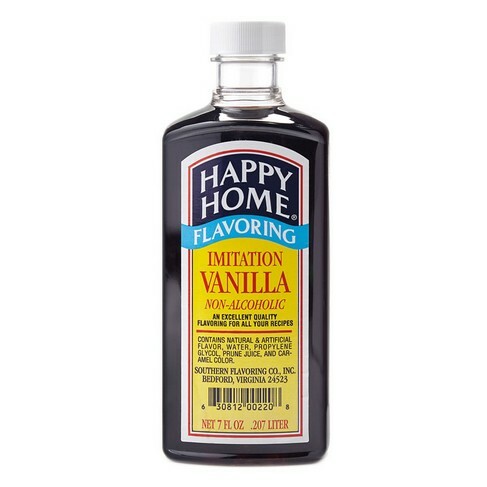 Happy Homes Imitation Vanilla Flavoring is a great product. It has the same flavor as vanilla extract and at way less cost. I have used this flavoring for years and it has always met my expectations. Excellent product. I use nothing but the best flavorings in my pound cakes. I have enjoyed using these flavorings. I started using them when I purchased them from a fundraiser. My order was processed the same day that I purchased the flavorings. I will be purchasing more in the near future. I really appreciate your promptness in shipping orders. My mother's home demonstration used Happy Home Vanilla for years. Although she died in 1999, my sisters, brothers, and nieces still think here is no other flavoring to use. Thanks. Wonderful product. I'm allergic to real vanilla (my throat swells shut) and this has really help keep my sweets at the top. We want thank your for all the flavoring we ordered. I am only writing a review for this one bottle but we ordered several flavors. All your flavoring is the best and we are ecstatic we found your website. We will be ordering more soon so we can get discounts because we intend to order it in quantity. The store we buy from cant keep some of the flavors in stock around the holidays you have to have rum and maple especially black walnut for all those delicious cakes. Again thanks for selling us this fantastic product. Love this product! Excellent service from a great company!